We’re friends, right? I show you the crummy knitting, you get all supportive and pretend it hasn’t been blocked, right? We’re all about process, yes? Well, here’s some process for you–the swatch I mentioned yesterday, my first ponderings about my Tennessee State Fair entry. So much to be humble about here. Yarn. I try out all the yarns to see how they knit up, a mix of Rowan Donegal Lambswool and Alice Starmore Scottish Campion, knitted on size 3/3.25 mms. Observation 1: I am eternally surprised at how different a yarn can look when it’s no longer in its skein. Those long, smooth strands can change utterly when they’re broken up into stitches. Observation 2: Color is relative. I mean totally. I keep thinking about Josef Albers, the artist about whom I know very little except that he spent a lot of his career contemplating the way a color changes depending on what colors are next to it. In my swatch, see that strip of blue? By itself, it is jade green, no fooling. Conclusion: I decided to go with A, B, C, and D as the major colors for this little coat. But stay tuned. Everything’s relative, right? The Pain and Itch of Intarsia. Take a peek. Look at all those ferny shoots coiling up there. THAT is what I’m talking about, along the hem and the cuffs of the Fern coat. See how smooth and elegant they are? Now, see the strange, lumpy areas on the right of my swatch? Test 1 is actual intarsia. 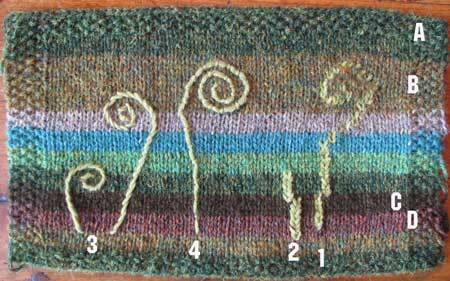 I defy anyone to do an intarsia fiddlehead that doesn’t look like it’s been pixellated all to hell. Even Sasha Kagan couldn’t whoopsydoodle her way through it. (Using cotton chenille doesn’t help, by the way. And being a terrible intarsia knitter may a problem, too.) Test 2 is duplicate stitch, something I have done boatloads of yet looks terrible here. At this point I abandon the notion of following the knitted grid and move on to embroidery, which allows a curve, for heaven’s sake. Test 3 abandons chenille for a nice smooth wool, shows some potential. 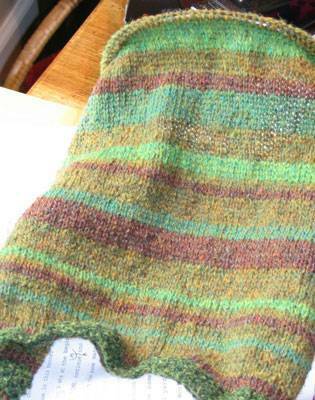 Test 4 is that stitch where you lay down a long piece of yarn, then stitch it down all around it. Test 3 may work, I dunno. One conclusion: I promise, you’ll be seeing no intarsia on this thing. The Pattern. Everybody please go out and support Ann Budd, whose Knitter’s Handy Book of Sweater Patterns is pure workhorse genius. I am imagining an old-fashioned little jacket with a yoke, a collar, and set-in sleeves. Do I want to crank the numbers to figure out those little set-in sleeves? Nope. Has Ann Budd already done it for me? Yay! I’ll draw a pitcher of what I’m envisioning. I started another swatch, to start figuring out how to use all the colors. But before I knew it, that Grundy County fresh air addled my brain and I was halfway up the back, randomizing the stripes and having a fine old time. I cannot for the life of me capture the color of this thing. (How I wish She Shoots Sheep Shots Gale lived next door.) Neither of these is accurate–the thing is just a deep, browny green loamy forestfest, what with the moss stitch moss along the edge. Seaweed, Bark, Heath, Leaf, Leprechaun, and Eau de Nil. The colors will get lighter toward the top, sort of the way the forest does. Or something. Advice/suggestions/comments welcome. My State Fair honor is on the line. OK. I think the ferns are BRILLIANT in the embroidery stitch that I think is called ‘couching’, no? Second from the left? You might lay down 2 strands and stitch that down for a thicker fiddlehead? I love love love it! No kidding! Not even TRYING to be supportive. I hope you are doing the fiddleheads in different shades of green. Tough love: I think the stripes are too stripey. The Fern Forest is not striped. Take a look at Kaffe’s Pattern Library. The Kaffe, he knows how to make the stripes irregular. You know, changing color in mid-stripe, skinny one-row stripes. Uneven. Somewhat undulating. I think this approach would rock. And since this jacket is a one-off, you needn’t worry about graphing it out. It can be complex and wonky. It is a Creation. But whatever you do, I SUPPORT YOU. I’m with Kay. It’s really really really hard for the human brain to try to do random, but regular stripes will compete too much with the ferns. Try cooking up some fiddleheads like in that skillet shot in your link. Who knows? Maybe they have a doors-of-perception mushroom effect that will set your stripes free. Or you could put the balls of yarn in a bag next to a die, roll the die to see how many stripes to knit and do a blind reach into the bag for the color. Love, love, love the embroidery! You say this is a jacket? Picking buttons will be fun. Very cool, so far! I love the stripes. The colors really sing. I don’t even mind the stripey-ness of the stripes :o), although I suppose it wouldn’t hurt to throw in a couple of one row stripes–kind of stripes within stripes if you’re so inclined. Speaking of artists, there is a nice Paul Klee quality to your sample. I would suggest, however, using colors in the embroidery similar to the knitting yarn so that the lines don’t hover about the picture plane, so to speak. And, keep the embroidery as flat as possible–maybe try using one strand (or two, if necessary) of crewel wool in a chain stitch. The chain stitch will give it presence–i.e., width–without being too bulky. This is way better than butter sculpture. The stripes look great, but try the broken stripes idea too. Who knows? As for the ferns, I like #3 best, but the duplicate stitch looks good too, mostly because they seperate themselves from the background. In the end it will all be down to your tastes vs. that of the judges. And as you are making it and someone near to you will wear it, your tastes maust prevail. My favorite fiddleheads are #3– so smooth and curvy! But I definitely see potential in #4 as well. The colors are great… This is gonna be gorgeous! Have fun! You’re already blowing away the competition, and the Fair hasn’t even opened yet! Tough love from me, too: Rather than horizontal stripes, is it too late to recommend vertical stripes? You would do them, of course, in intarsia (which I know you’ve sworn off for this project), and you could make them a little wavy rather than exactly vertical…which seems more “forest-y” to me. You could have the darker sections get slimmer as you move toward the top, and the lighter sections get wider, to accomplish your “lighter at the top” idea. I, too, like Embroidery Test #3, although I can easily picture #4 done with BEADS where the yarns are couched down. The only way I have ever been able to get a smooth curve with couching is to have lots and lots of the “holding down” stitches. What a pain, though. And now I have *got* to get started on MY entry for YOUR State Fair! If you want truly random stripes get a couple of dice (you can get them with 4,6,8,10,12, or 20 sides at gaming stores). Since you have 4 colors get a 4 sided die and a larger one (maybe 12 sided or 20 sided). Assign a color to each number of the 4 sided. Roll both of them take the color from the 4 sided (if it is the same as the color you just used roll again) and knit the number of rounds from the larger die. I like the look of #3. Or try Art Nouveau for fiddle heads. They’ve already abstracted just about everything natural. Hey! I just got (in the mail) a pack of Gees Bend postcards! So cool! Oh my the colors are magical. My first thought of fern #1 is that it look like a question mark, be sure not to use it, some stange Judge mind may actually work like mine! 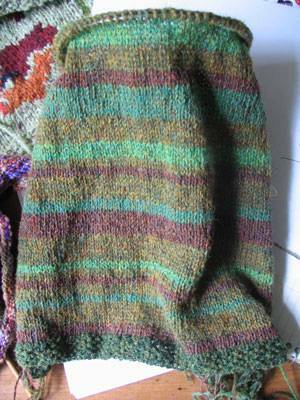 I like the idea of vertical stripes, you could do it side to side to avoid the intarsia. Um, I like the intarsia fiddlehead. I like how it blends in and is kinda unobtrusive while still being decorative. If ya know what I mean. How about Jack’s Back stripes or something more…. more… you know, less plain-old-horizontal-stripey? Not that these are plain old stripes, of course, being in colours like Heath and Bark! Gotta get me some of that! This is so thrilling, I must say…. I really like the #3 version of your fiddlehead ferns. I love the colours and general stripey-ness of your jacket. I also really like the top of the interstartia fiddlehead. It looks like you are just glimpsing it through the forest. Perhaps you could combine some of those with emboidered ones a la number 4 and the bottom of the number 4 could hide where the bottom of the interstartia ones would have been? Either way it’s going to be beautiful! I’m down with the broken stripes. Let the spirit of the Kaffe into Grundy County. On the fiddleheads…what about really skinny I-cords? Hm? I like it! Great colours! And #3 is my favourite fern (just for the record). Wish I could help out with the photos from next door. Color management (as we photographers call it) really is the last frontier. Just keep dragging the knitting around to all different light situations at different times of day. Some colors dont record well on some digital cameras. (Lotta help I am!) Words of encouragement on the fern sweater , I just love this. I also think fern technique #4 looks best. Looking forward to seeing the process continue. That is very cool. My personal favorite for the fiddleheads is #3. I think you might want to use a tiny amount of blending filament when you are done and duplicate stitch patches here and there to give the effect of light dappling through the forest. just my 2cents. I’m knot a knitter…but I am a produce manager who sells lots-o-fiddleheads for a few weeks a year and your inspired creation is feaking awsome! warms my heart to see something i see sometimes as work…. Trouble is, when I see 4-ply wooly stripes, it just screams “FELT ME” to me. which would make a very teensy jacket. I’m not suggesting that you put your work anywhere near a washing machine (does make stripes go more hazy though), and I think either fern 3 should do the trick – couching on a child’s jacket is just asking for the ends to be picked out by little fingers. Mary B’s quilt is just the thing, isn’t it? Absolutely gorgeous and perfectly evocative of the “undersea world.” After seeing this, I’m thinking the vertical stripe crowd is on to something. Though I do NOT recommend tearing out what you’ve done. Fasset broken stripes and (I know this is evil…) intarsia ferns over-stitched in different directions for depth. Hey! I love your ideas swatch, what better way to eventually save time in the long run? I like test 3 the best, but have you considered doing that thing where you use a crochet hook to put designs on the fabric? You know, where you chain the design into the knitted fabric? that may well work for your cause.